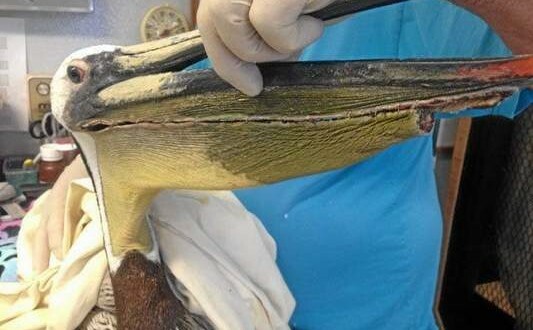 A California Brown Pelican whose entire pouch was cut with a sharp object like a knife is in stable condition at International Bird Rescue’s (IBR) bird hospital in San Pedro. The bird was found at 5400 Ocean Boulevard in Long Beach on April 16th by Animal Control. A reward of $2,500 is being offered for for information leading to the arrest and conviction of the person or persons responsible for the mutilation of this bird. possible felony on a Federal level. well documented and cases like this are taken very seriously by law enforcement officers. Anyone with information that might lead to the arrest and conviction of person responsible for the mutilation of this bird should contact USFWS at 310-328-1516. This bird will undergo one or more surgeries involving hundreds of stitches to repair the pouch. Temporary staples are currently holding the pouch in place so the bird can eat and gain strength.